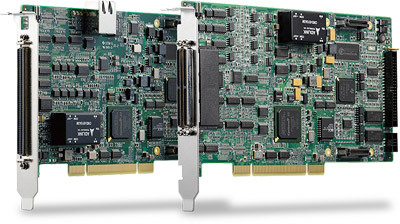 ADLINK's new PCI-8254 and PCI-8258 incorporate up-to-date floating-point DSP and FPGA technology to provide high-speed and high performance hybrid analog and pulse-train motion command. Leveraging ADLINK Softmotion technology, the PCI-8254/PCI-8258 offer more comprehensive and application-oriented motion functions to reduce the development time but maintain superior throughput and accuracy. Also delivered is excellent synchronous motion control performance. The PCI-8254/8258 adopt fully closed-loop control with PID filter plus feed forward gain to realize high-speed and high-precise motion control capacity. Feed forward gain can reduce speed profiles following errors for faster rising times. In many fabrication applications, interrupted path trajectory can damage substrates or workpieces, and multiple axes must be managed. 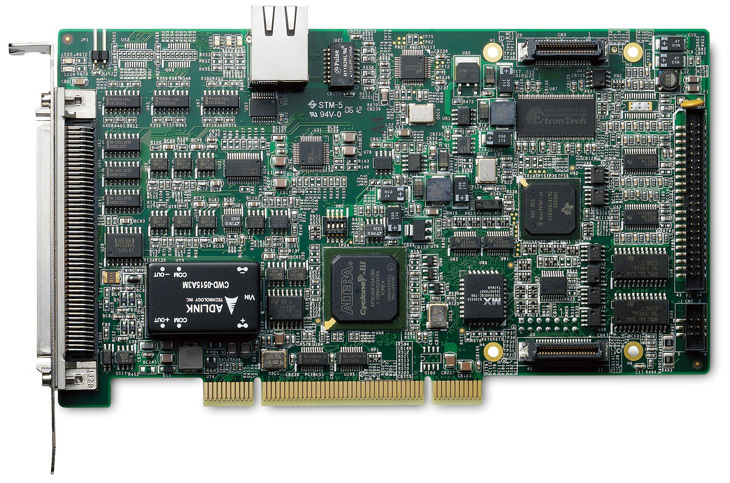 The PCI-8254/58 provide program download and execute up to 8 simultaneous tasks, while automatically controlling all onboard I/O and generate motion trajectories, and can even be deployed as a standalone controller. To ensure smooth movement along the path, the PCI-8254/8258 incorporate blend motion which looks several points ahead and combines splining motion for continuous and smooth velocity movement. If more than one move is specified in succession with no pause in between, the first movement will blend into the second with the same type of controlled acceleration as is done to and from a stop. The PCI-8254/8258 provide higher motion control performance by a fast encoder input frequency up to 20 MHz and also provide hardware-based high-speed position comparison and trigger output speed of up to 1 MHz. "MotionCreatorPro 2" is a Windows-based application development software package included with the PCI-8254/PCI-8258. More applicable time-domain and frequency-domain diagnostic tools are integrated into this utility for Auto-Tuning, Frequency Response Analysis, motion & I/O data sampling. Setup Wizard shortens the system installation & evaluation time and allows monitoring of onboard DSP & I/O consumption via a system diagnostic page. Powerful sampling page and graphic tools deliver real-time motion and I/O status and conduct further motion flow analysis. Laser cutting and engraving techniques use a laser to process materials which are commonly used for industrial manufacturing applications, such as cutting plastic, metal, coated metal, stone, and glass. The laser engraving process leaves a clean edge for a high-quality surface finish. Industrial laser cutters are used to cut flat sheet-like materials as well as structural and piping materials. Laser cutting and engraving equipment compose of a laser generator, a controller, and a work piece (surface). Normally, the laser beam has a focused spot of 0.2 mm diameter at the cutting surface and is emitted from the laser generator which allows the controller to trace patterns onto the surface. The controller masters the irection, the intensity, the speed of movement, and the spread of the laser beam aimed at the surface. The surface is picked to match what the laser can act on. Compared with mechanical surface finishing processes, laser cutting offers advantages over mechanical cutting processes, including being easier to work with, reducing contamination of work-piece, and a cleaner surface finish. To complete CNC processes, laser cutting and engraving processes are applied to make the molding, work the surface, cut the material, drill PCB holes, and cut electrodes. The laser cutting takes direct input in the form of electronic data from a CAD drawing to produce flat form parts of great complexity. By using laser technology, accuracy and precision can be easily reached. One challenge equipment manufacturers face is how to control the intensity of the laser with synchronous positioning and speed movements. To improve the smooth path of a uniform laser process, the ADLINK PCI-8254/8258 utilizes a look-up table to ensure accurate variability of intensity and speed of movement. In addition, the PCI-8254/8258 provides both PWM and analog signals to control the intensity of the laser precisely by separately changing the frequency or period of PWM signals. 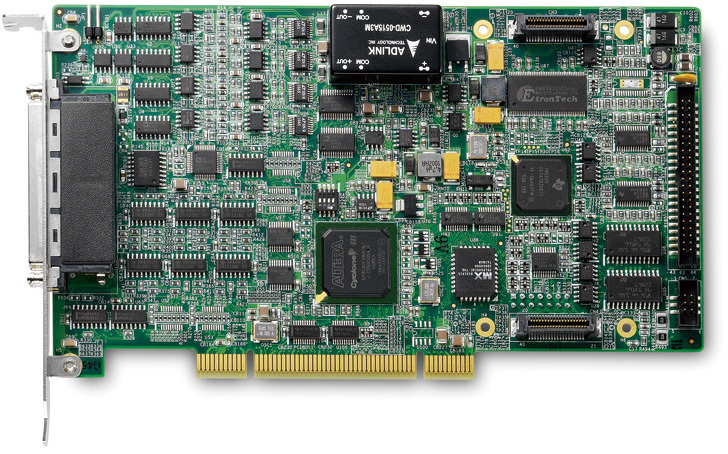 The PCI-8254/8258 also features a point-table function to simultaneously perform a particular path and control on-board I/O based on the electronic data. Through DSP technology integration, the PCI-8254/8258 further provides velocity planning, trajectory smoothing, and automatic point-feeding to perform 2D laser-table (X-Y table) movement precisely and smoothly. Easily upgrade equipment performance which uses a DSP-based closed-loop controller instead of an opened-loop controller. Available to process more various materials such as polymers, multi-layer plastics, etc.